President Obama and his family arrived in Cuba on Sunday, the first a sitting U.S. president has visited the island nation since 1928. The world was a different place. The Holland Tunnel opened only two months earlier under the Hudson River, linking New Jersey with New York City, and the first air-conditioned office building opened in San Antonio. Prohibition was still intact. Coolidge traveled to Cuba to address the Sixth Annual International Conference of American States in Havana on Jan. 16, 1928. 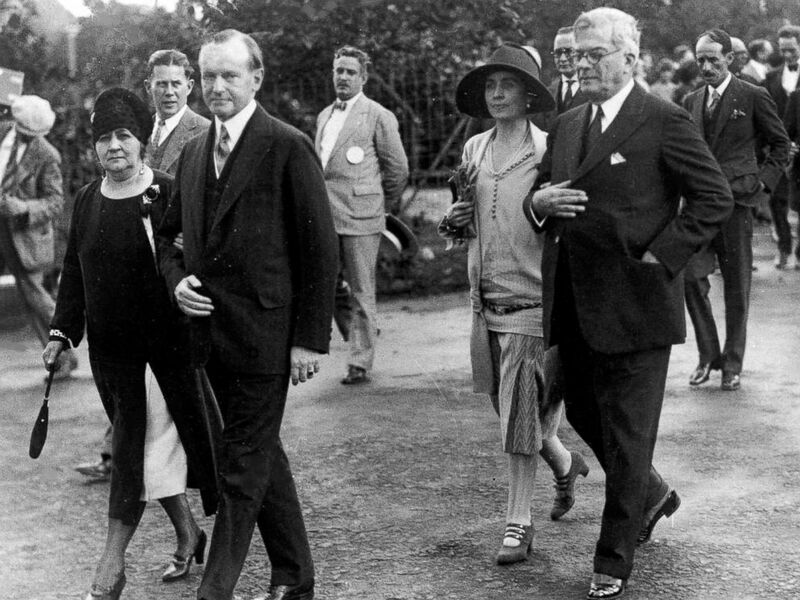 Coolidge and his wife met with Cuba's President Gerardo Machado, who was in office from 1925 to 1933 until he was forced into exile. Cuba was the only foreign country Coolidge visited while in the White House, and he was the only sitting president to visit Cuba, according to the Calvin Coolidge Presidential Foundation. At the time, Benito Mussolini ruled Italy. Months before Coolidge's visit to Cuba, Leon Trotsky was expelled from the Soviet Communist Party, leaving Joseph Stalin in control. About a month after that, Iraq began negotiating independence from Britain. Coolidge rode a presidential rail car without air-conditioning to Key West, then boarded the U.S.S. Texas battleship for the overnight trip to Havana, 100 miles away. President Calvin Coolidge and his wife, first lady Grace Coolidge are shown with the President of Cuba General Gerardo Machado y Morales and his wife, Elvira Machado, walk on the estate of President Machado in Havana, Cuba, Jan. 19, 1928. "The thirty-two-hour trip down to the tip of Florida was decorous and dull," Saturday Evening Post reporter Beverly Smith Jr. recalled in a 1958 article, "To Cuba With Cal." "Cal was granting no press conferences." After the boat arrived, "The crowds were tremendous and enthusiastic," Smith wrote. "They cheered themselves hoarse for Presidente Coolidge. They pushed close to his car, blowing kisses and throwing flowers. Cal, seemingly touched by this unaccustomed Latin warmth, showed more animation than usual. He bowed, he smiled, he took off his silk hat." At Machado's estate, Smith watched whether Coolidge would accept alcohol, publicly offered by a waiter with "a big tray of delicate, crystal cocktail glasses, each sparkling to the brim with a daiquiri -- rum, fresh lime juice and sugar, well shaken." "Cal himself, of course, was the cynosure of the drama," Smith wrote. "As the tray approached from his left, he wheeled artfully to the right, seeming to admire a portrait on the wall. The tray came closer. Mr. Coolidge wheeled right another 90 degrees, pointing out to Machado the beauties of the tropical verdure. By the time he completed his 360-degree turn, the incriminating tray had passed safely beyond him. Apparently he had never seen it. His maneuver was a masterpiece of evasive action." In his speech, Coolidge said, "Thirty years ago Cuba ranked as a foreign possession, torn by revolution and devastated by hostile forces. Such government as existed rested on military force. Today Cuba is her own sovereign. Her people are independent, free, and prosperous, peaceful, and enjoying the advantages of self-government."